It’s that time of year! Holiday parties! Pot-lucks! Get togethers! They all have one thing in common: snacks! This recipe is a handed down tradition in our family. 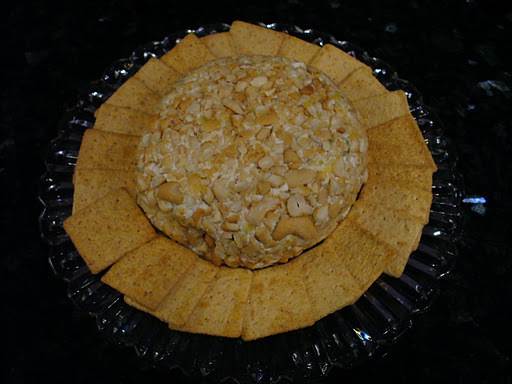 It is not holidays (Thanksgiving, Christmas or Easter) without Mom’s Famous Cheeseball gracing the table. My mom started making this recipe when she was in Junior High. I probably started making this recipe around the same time…I have always loved it. This recipe has an odd mix of ingredients, but trust me, they come together deliciously! In fact, over the past couple of years I have shared this recipe with some of my best girlfriends. It has been a hit! They have taken it to their own family gatherings and it is now being requested for holiday gatherings in their families! 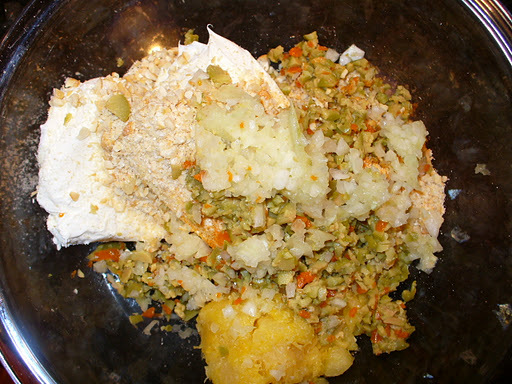 Using a potato masher, mash the ingredients together until well mixed. 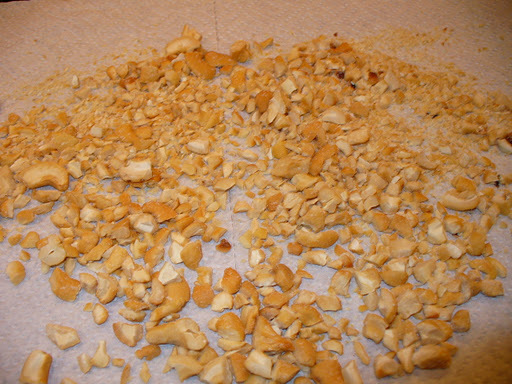 Spread the coarse chopped nuts on a paper towel. 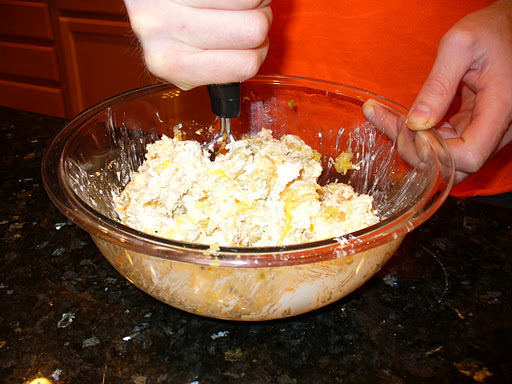 Depending on how large you want your cheese ball (I usually use about 1/2 the mixture at a time), scoop out the cream cheese mixture with your hands (I use little sandwich bags to keep my hands from getting messy) and shape into a round-ish ball. Take the ball and roll it around on the coarse chopped nuts. 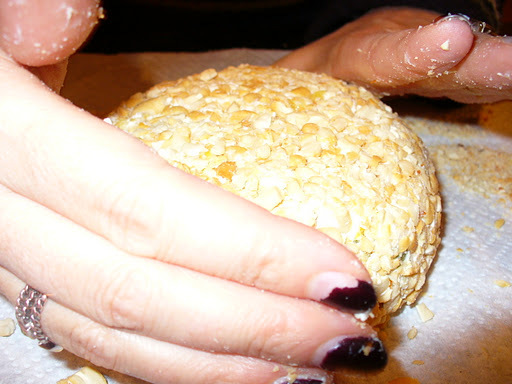 Use your hands to pat and shape the ball and ensure the entire surface is covered with nuts. Add crackers. I like Wheat Thins, but you can use whatever you and your guests prefer! Voila! 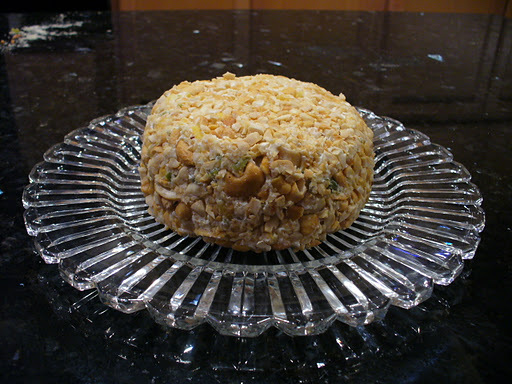 You now have a delicious cheese ball to serve as an appetizer or snack for your holiday gatherings! You can make this ahead and refrigerate it (wait to add the exterior nuts to maintain best texture). The flavors tend to meld and come together even better after a few hours in the fridge. Plus, it only takes about 5 minutes to put it all together. 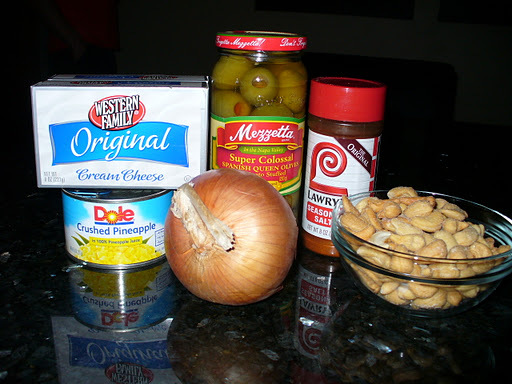 This entry was posted on December 3, 2011 by Corrie Beebe in cooking, food, recipes.